CollegeFabricStore.com has been supplying NCAA college cotton, NCAA college fleece fabric and NCAA college ribbon to dedicated fans, event planners, designers, quilters, and crafters for over a decade. These products feature your favorite collegiate team in bold and vibrant colors. 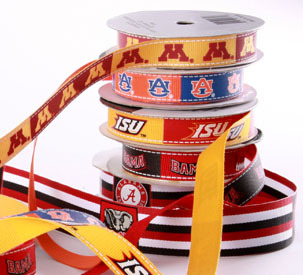 All of these university logo fabrics are manufactured with the highest quality materials. We carry up to 10 designs per school, and offer over 100 of the most popular colleges and universities in the USA. Everything we carry is licensed by each and every school to ensure colors and logos are accurate. We are always adding new schools and patterns. We work with many types of people who use college cotton, fleece fabric and ribbons. Each and every order is hand cut to meet your exact requirements. Collegefabricstore.com is one of the largest retailer of officially licensed fabrics in the country, carrying over 2,000 unique designs. We pride ourselves in our offering a wide array of schools as well as fabrications. If it is made, we have it! We work with many types of people who use college cotton, fleece fabric and ribbons. Create an atmosphere of loyalty and excitement at the next event by decorating the space with your college team logos displayed on cotton and fleece fabric and ribbons. Use them at entrances, table cloths and linens, backdrops and or any way you see best. College themed parties are still one of the most popular themes. 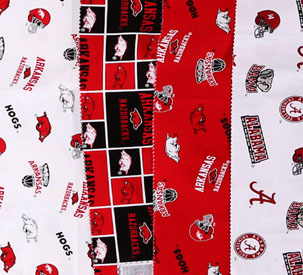 Our college cotton and college fleece fabrics are also a great way to accentuate team pride for bachelor and bachelorette parties, baby showers, weddings, and reunions. 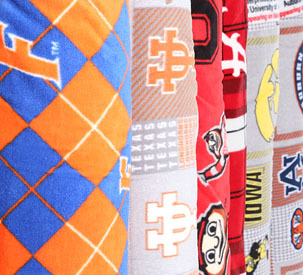 Turn these great college cotton and fleece fabric and ribbons into a great gift that you could be proud of. They can be used in a variety of imaginative ways to create practical every day or custom applications. College no-sew fleece tie blankets, pillows, scrapbooking, aprons, home linens and decor, and clothing are just a few of the ways we have seen our fabrics used...the possibilities are virtually endless and they will surely be a gift cherished for ever. When it comes to sports, fans can be fanatical about their favorite college teams. There is no better way to support your university team at the game, at an outing or even at home than with our cotton and fleece fabric products. Waving a team flag while rooting or snuggling up with a fleece blanket is always more fun when your college team logo is displayed on it. Get creative with your team pride and show off your personal work with your favorite team's colors and logo in clear sight.